Oh hey, I'm still here. I may have over booked & over exerted myself over the past two weeks, and I am paying for it. Today was the first day in over two weeks that we did not have company or I wasn't traveling. I'm just a bit exhausted. But the bigger issues are my pink eye (ugh) & mild case of mastitis (double ugh). And with all that fun going on, we are in the land of teething. Rough times all around. The Teethers: Here's what Finn is working with these days. Sophie (4) is obviously the classic. The Lifefactory rings (1) are the most easily manipulated by little baby hands. Chew beads (6) are convenient since they are worn by mom. However, I think I need a new teething necklace that perhaps is a tad more fashionable. The HABA Snake (5) is simply an adorable & fun toy that duals as a teether. I could seriously buy all the HABA toys; I just love them so! The rabbit ears (2) are perfect for dipping in water and then placing in the freezer, as is the star Aden + Anais teether (3). I'm loving our current collection, but don't be surprised if I add some munch mitts into the mix soon! 1 // 2 // 3 // 4 // 5 // 6 The Bibs: I used to hate bibs. They can really destroy the whole look of an outfit the second you put one on. But they also happen to be a necessity. I'm loving the bandanna/handkerchief style. My favorites are from grey + gingham, and are by far the most stylish! I believe they are about to launch their Fall line, so look out for that! I'm also eyeing some other options, like these black & white beauties . 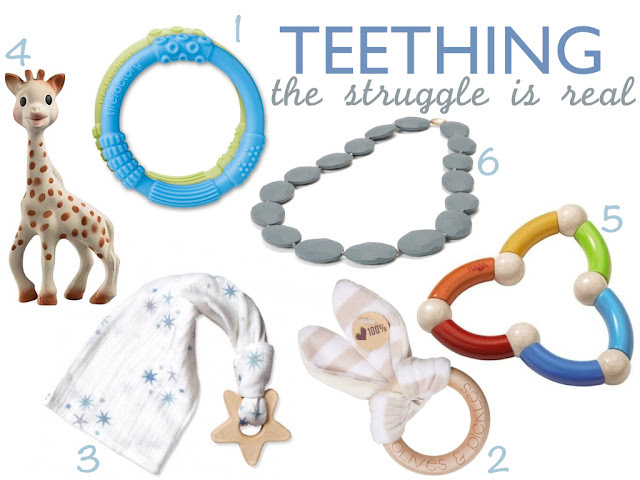 The Remedy: Teething is rough; the struggle is real. And while I'm very against most of the tablets & gels that numb the mouth and are full of nasty ingredients, I do use one homeopathic option. Camilia was recommended to me by a few of my more natural minded mama friends, and I swear that I notice a difference in Finn. I also totally believe in the placebo affect. So regardless, I'm calling this stuff a win! We're cutting canines all 4 at the same time...its been brutal. Im with you, we just use Tylenol for pain as our led advises against the gels & tabs. This too shall pass! Great ideas, seriously this could work for older babies too! Sophie's been cutting her molars like crazy and it's not a happy time. My heart goes out to Finn, it's no fun but him or you :( but I hope he gets better soon! Those teeth options look great. I swear Mabesy is working on teeth too. So much drool!!! We love Sophie and I have a few grey + gingham bibs on hand too. Love em! It's true; it's so exciting when that first tooth pops through! Thinking of you all!! Poor Finn and hoping that you're feeling better soon, too! There are no teeth in sight for us, but there is so much drool and Logan loves all the teething toys! We have a set of 'keys' that we put in the freezer and he loves those. We need to get some of those cute bandana bibs too. I hate covering up his cute outfits with the boring plain ones! Good luck, my daughter cut all 4 of her molars back to back and Im still recovering. Sophie really is a lifesaver. Hylands teething tabs are homeopathic and have worked wonders for us, especially with helping settle down for a nap. Oh man, I feel like teething lasted forever! Is it affecting his sleep? I found noah could placate himself during the day by chewing on everything but at night it just bothered him and there was barely anything we could do! It's such a beast, that teething. Stella only has 4 teeth so far and I feel like it never stops. Ugh... Great list, though! Please, oh please check out this tiny business from an acquaintance of mine. They are the cutest and most amazing teething necklaces. The price can't be beat and they are adorable for mom to wear! Ooh I just love them! This is exactly what I was hoping to find! Thanks Sarah! Teething is the worst. Just when we thought we were in the clear of all the newborn craziness, boom, teeth. And then when those molars came... those were the devil. Mila has all of her teeth now and I'm already dreading teething for any future children that we don't even have yet. I feel you and I hope you guys get through it quickly. Have you tried the teething necklaces? I wasn't going to try them, but I was desperate when the molars starting cutting through and it really seemed to help. No fun! N is a drooling fool and his nose is all yucky. His sister did the same thing teething. I'm not 100% that we are on that road but it sure feels familiar. Good luck. Aria was such a champ when it came to teething! Except the molars which was a month long party. I love all these teething aids though. I'm saving it for later, just in case! We had those Lifefactory rings too and I swear Mason loved them! Them and Sophie. In fact, I feel like maybe you are the one I learned about them from when Liam was using them. Aww, full circle. Hope that sweet boy pops some teeth through soon so he feels better! You just opened me up to a whole new world with the Munch Mitt. We need this! Louise ONLY wants her hands in her mouth...this is genius. Thank you! And, I hope you start feeling better now that things have slowed down!